A formal culinary education comes in many forms. For Ryan Hardy, it came in waves and pulses, much like the music at his gastronomic success in Soho. Hardy proposes travel as the most profound and immediate way to acquire new culinary perspectives: from the swaying grasses of Tuscany to the New England sea breeze in Martha’s Vineyard to the ski-in/ski-out lifestyle in Aspen, Colorado. In Italy, Ryan saw the dining experience through the eyes of the Italians: mealtime as the highlight of the day. Meals are not just a break, not just a necessary occurrence to keep energy levels up, but rather a time to gather, to slow down, to converse, and to savor the ingredients grown or raised nearby. After many years of moving and cooking for various restaurant owners, Ryan finally secured his own space, along with co-owner and sommelier Robert Bohr, on King Street just south of Greenwich Village. Charlie Bird is a culmination of his travels, his experiences, and the people who have influenced him over the years. Indeed the menu encompasses many elements of Italian regional cooking, but it is quite impossible to pin down Chef Hardy’s cuisine. After all, isn’t the point of traveling and working with various cuisines in various regions to build and expand and to enable innovation on one’s own terms? It’s like asking a chef, ‘what is your favorite food?’ It is a mix of the right ingredients at the height of their life cycle, a sustainable fish caught in season, a wine list painstakingly curated and researched… The restaurant concept is everything down to the napkins. It is the chef’s mood. It’s really a thousand things. 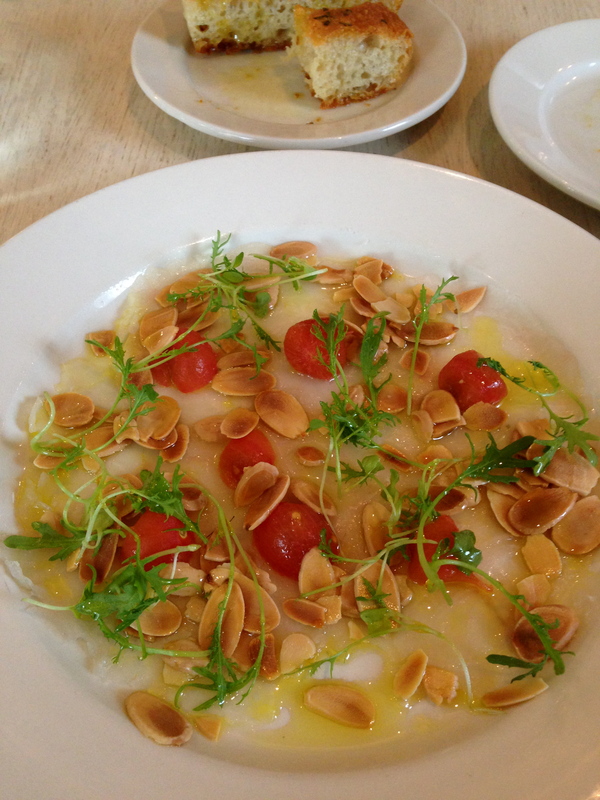 Whatever Charlie Bird is, it has become one of my ‘go-to’ restaurants in the neighborhood for a simple yet inspired and artfully composed Italian-ish meal. The menu changes constantly along with the season, as any good menu should. Ryan floats in and out of the dining room, extracting himself from the kitchen to say hello to friends and diners alike, to check in with his staff, to survey with a gracious smile. He is a fantastically friendly, approachable chef and clearly understands the importance of hospitality. His staff is well-trained but not stuffy, attentive but not overtly so. They are knowledgeable and well-informed about each menu item and ingredient, and one can tell that they truly value their position in the restaurant, that they respect their post and their chef, which speaks volumes about Hardy and the way he and Bohr run the business. 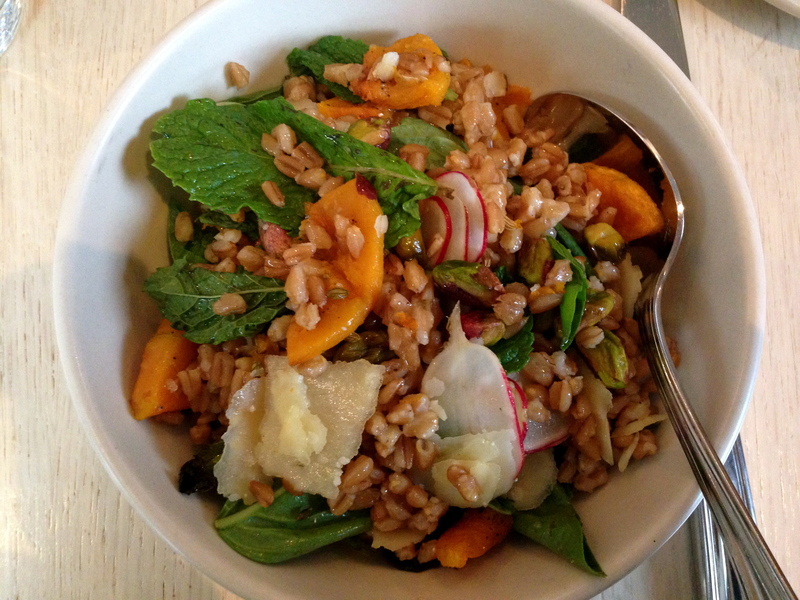 Farro circa early April 2014: You wax nostalgic for those life savers, and I do the same for this winning bowl of goodness. I often find myself jonesing for Hardy’s famous farro dish. Try as I might to be a versatile orderer at a favorite restaurant, I cannot seem to unglue myself from the vividly hued bowl. 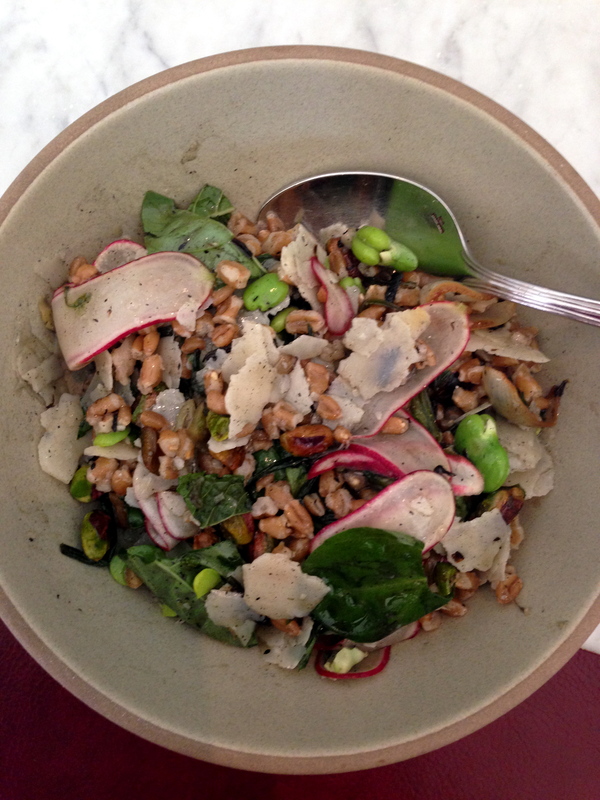 The first time I had the aforementioned farro was back in the first days of April, and it was a rather genius color and texture combination of vibrant mint, generous shards of parmigiano, toasted pistachios, thinly shaved radish, and moon-shaped pumpkin. Each flavor complimented one another like instruments in an orchestra; they played to one another’s benefit, so simple and sublime. I savored the last few spoonfuls (the serving is plentiful, especially considering that farro is wonderfully filling and a single serving is a lot smaller than you think). Hardy’s leftover farro stays for days in the fridge, and it is a superb addition to any tossed salad or really anything at all. It has since changed as the weather has grown warm; about two months ago it invited grilled ramps into the mix, giving it a sort of burnt tinge, and most recently included spring onions, favas, pistachios, mint, and shards of parmigiano. I will forever miss the pumpkin version and hope very much that it returns next year. 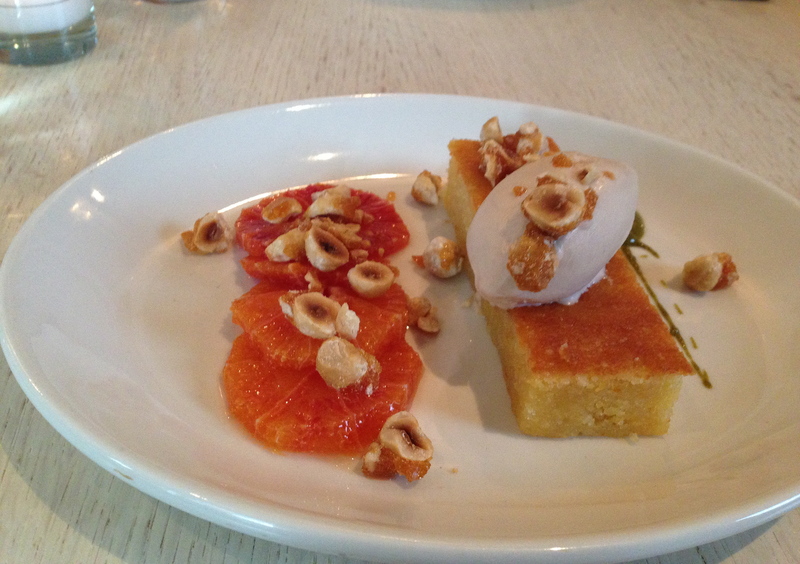 The blood orange cake the way I remember it from early April. That would be: perfect in every way. Now seen: the absolutely necessary dollop of pistachio. 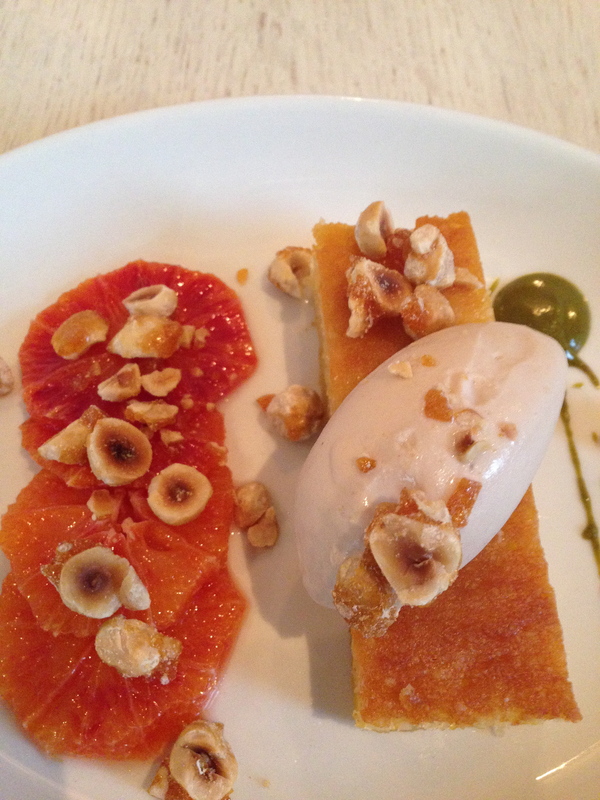 The other item I cannot seem to say no to is the Blood Orange Cake. The first time I indulged, back in early April, the beautiful array of colors arrived in the form of one dynamite lime green circle of pistachio, one exceptionally moist rectangle of orange cake, one scoop of silky caramelized hazelnut gelato, scattered cracked hazelnuts, and a handful of ever so ripe blood oranges, exuding a burnt orange sky as if Hardy took cue from the sun setting over rolling Umbrian hills. This is one of those dishes where one needs a little bit of everything on each forkful; it was simply meant to be savored in this fashion. 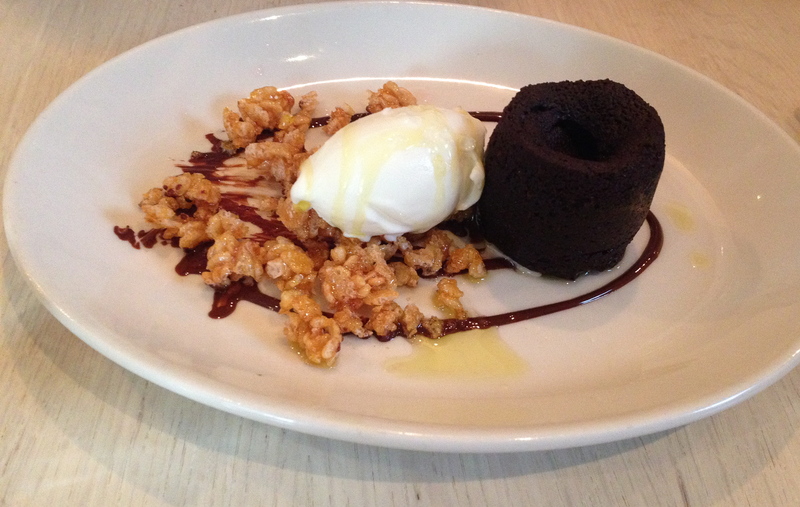 The chocolate bundino is worth mentioning as well. If you love chocolate, I urge you to order the velvety bundino. Also ordered on my first occasion: the side bowl of braised Borlotti beans with escarole and roasted chiles tasted like a bowl of Tuscany in SoHo. They were warm, textured, and balanced just so between thick and thin. This can also be brought home and served cold for lunch. 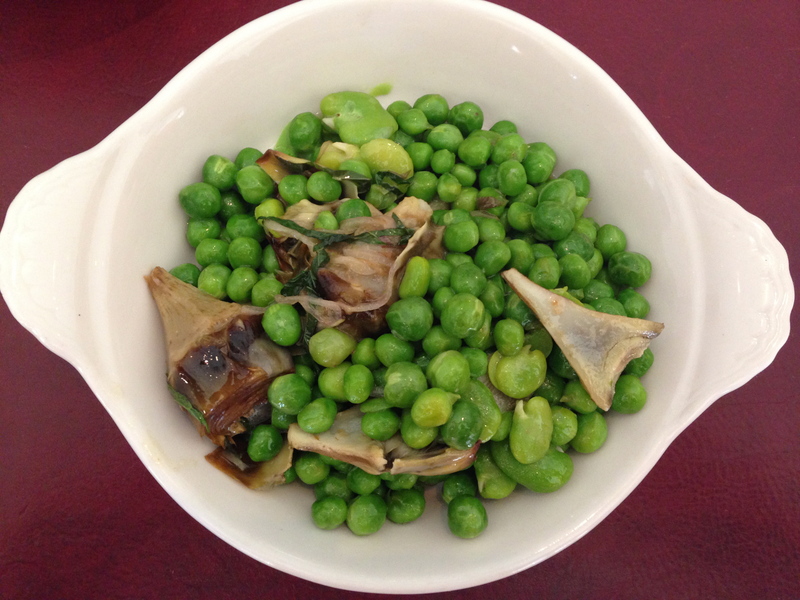 The minty spring peas with artichokes and favas that I had back in April are another example of this; I could have finished the whole bowl in one sitting, but I savored a small amount to sprinkle on my salad the next day. Radicchio salad with tender artichokes and wonder strawberries. 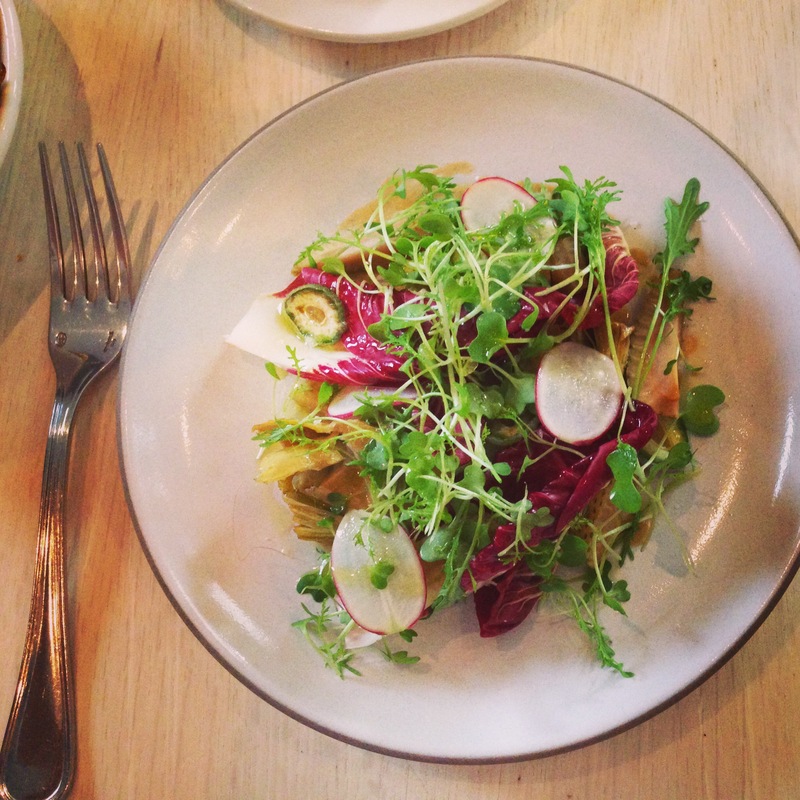 Forefront: radicchio salad with artichokes. Background: brussels, borlotti, and farro. 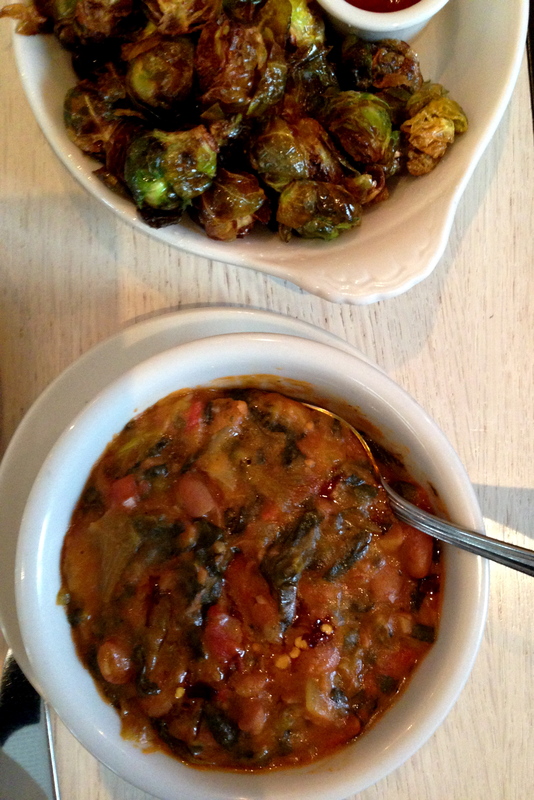 Brussel sprouts and borlotti beans, photo taken and food devoured in early April. Focaccia, fresh out of the oven and still warm in my fingers, is always a promising start. 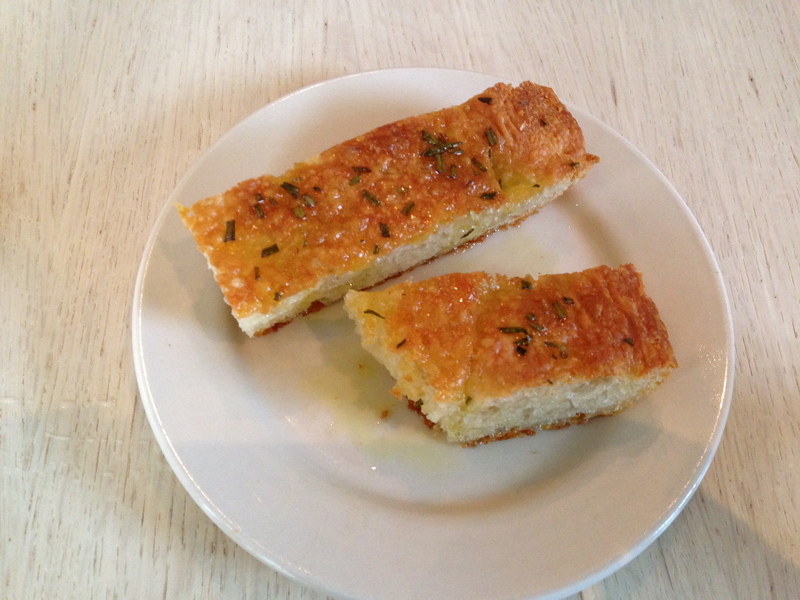 Topped with rosemary, the bread has just the right amount of spring to it, not too tough but not too oily. 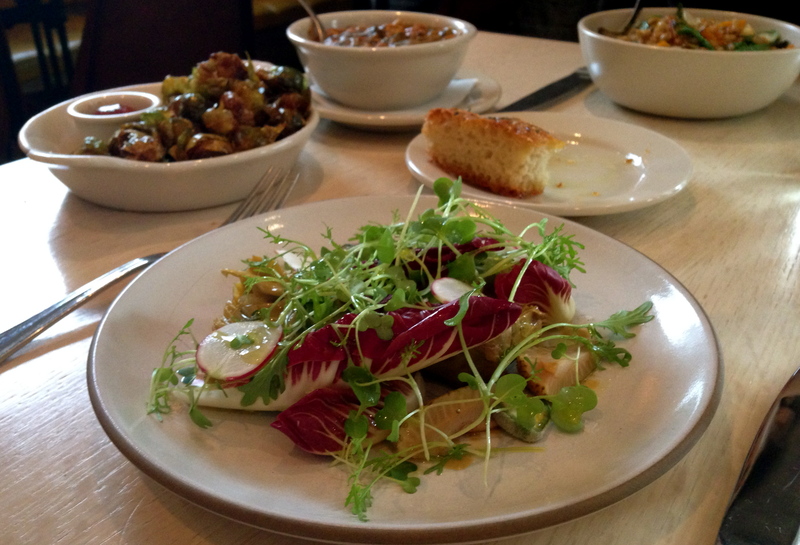 On my first visit, my friend’s radicchio salad with tender artichokes and crisp radish was a visually beautiful plate and studded with seasonal sprouts, yellow wonder strawberries, and candied walnuts. This friend is always willing to try a restaurant’s oysters, and she was very happy with that evening’s selection. Another companion cannot stop ordering the razor clams, and while I did not try these dishes myself, I was told by neighboring diners that the rigatoni with spring lamb ragu was rich and fabulous, if not a little heavy on the salt. Also reported by aforementioned neighbor: the braised rabbit with spring onions, pancetta, and fava bean hash was cooked to perfection; ever so tender and with a decadence complimented by the lightness of the favas. 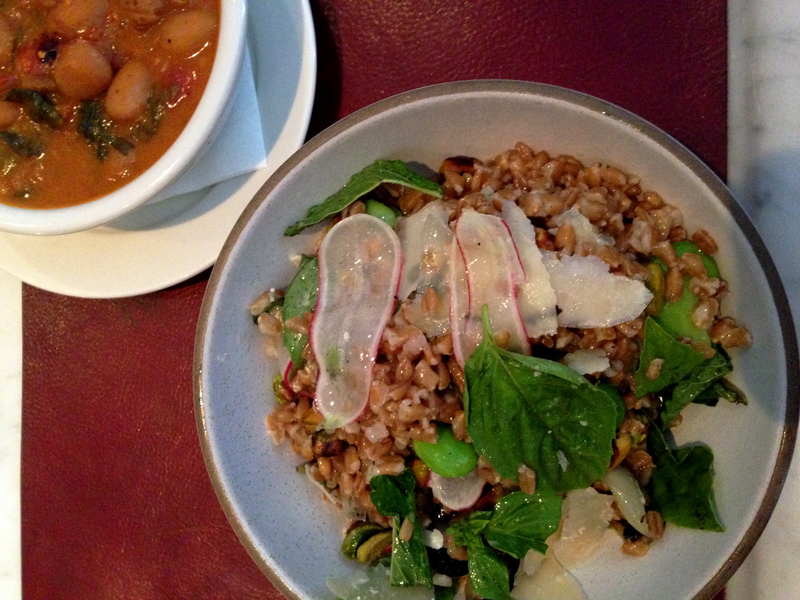 A May visit: the borlotti beans and farro with favas. The space itself is unbound by convention, and the ambience is energetic and increasingly loud. The banquets are bright yellow, the chairs a weathered brown, hand-sewn leather, and the bar a polished marble. The delicate fresh flowers throughout juxtapose a somewhat masculine appearance. In the bathroom, jars of multi-colored lifesavers make me laugh, and I think, ‘now who thought of that?’ Their nostalgia leads me to believe that there is a personal story to be told there. The wine glasses are worth mentioning; their form is so different from the typical shapes seen around town, adding to the stark visual contrasts in a somewhat minimalist environment. Hardy and Bohr took a chance with the music, stubbornly sticking to the rap tracks that feel somewhat out of place early in the evening when the restaurant is still taking flight, and somewhat ‘downtown, I’m in a movie about the beautiful people and their beautiful New York lives’ later in the evening, when the restaurant is packed and models are arriving with tall dates. The diners, however, are a solid mix of demographics; pretty young things and more mature couples, yuppies eager to be fixtures at a hot restaurant, and those who appreciate good food and who come simply to enjoy Hardy’s innovative twists on Italian cuisine and Bohr’s expertly chosen wine list. Chef Ryan Hardy and celebrated sommelier Robert Borh clearly understood the importance of timing when they decided to open their own restaurant. They have both been in the business long enough, each with their own grocery list of successes, to know that it takes a village to achieve longstanding success in the New York restaurant scene. 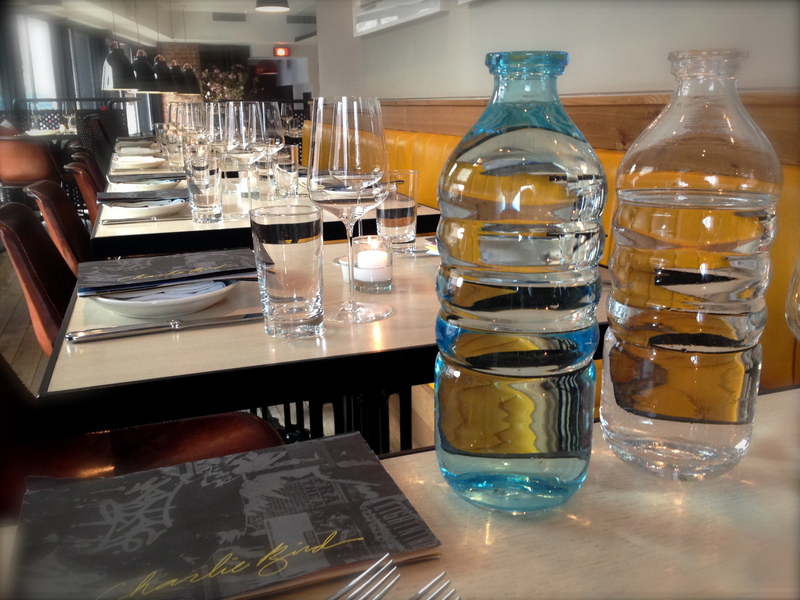 This is not Martha’s Vineyard, and it is not a small town in Italy; New York is an epicenter of culinary dreams. It is the land of throat-cutting competition and fickle diners. To pose a restaurant as worthy of even just one repeat visit is a far-fetched stature that some businesses will simply never achieve. Charlie Bird has tilted itself just so, has found its niche, and has categorized itself as not just a hot restaurant, but a local favorite worthy of second, third, and fourth visits. Perhaps it is not the place for the long, drawn out meal a la Italia, where you spend hours at the table conversing with your companions (mostly because you will not be able to hear them after a certain hour), but it is a version of a little bit of everything that ever inspired Hardy and Bohr, two gentlemen that exude creativity, innovation, and sociability.